GCP Software provides an out-of-the-box Omni-channel software for SME and corporate banking including a payment manager module. The main requirement of most business banking customers is simplification. They want the digital interaction to be simple, straightforward and add value. Consumerism is reaching the B2B relationships. Business customers expect payments to be handled seamlessly and efficiently. Account holders expect to be able to run their business from any device with similar user experiences and features allowing them a hassle free real-time experience, and have an overview of all their financial positions in real time. In order to drive customer satisfaction, banks should be able to address the different needs of the segments within the business banking arena. A large corporation will require a different set of functionality, workflow and authorisation compared to an SME type business or a self-employed customer. Most banks today lack segmental mobile banking solutions. Banks must be ready to meet the changing needs of small-business owners, especially for the important segment of SME’s. Most apps are either rebranded personal mobile banking solutions with a standard functionality for individuals or multifunctional corporate apps with the primary focus on enterprises. Although using the same infrastructure, our business banking part is specifically designed for the target group, allowing a split in a different segment, customer experiences and functionality. Profiles and related UI and functionality are easy to manage via our mobile middleware server. Segments can be created in days to address the need of the specific users in the different segments. 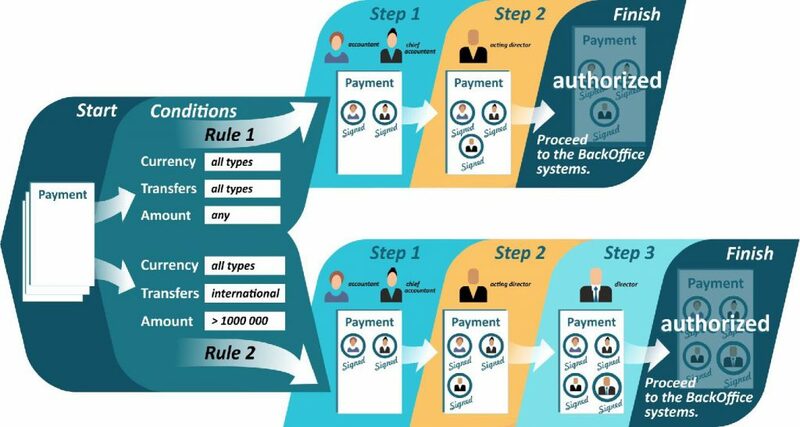 To support authorisation, our very flexible payment functionality not only manages a single company level, but also more complex multientity structures and authorisation levels. Levels and access rights can be defined, based on the specific business segment rules. The business banking software can be extended with a payment system offering the business accounts full freedom to make a wide range of payments. An automated payment processing system, compatible with other banking systems and networks, provides a complete payment processing cycle and acts as a central dispatcher. Use mobile technology to become a business partner of your SME’s and creates a competitive differentiator. Create a win-win situation between your retail customers and your SME’s. Our mobile software offers the functionality for companies to create special offers within the banking app. Customers can subscribe to offers of products of their interest (to avoid spamming). Benefits only if your cards are used. A powerful argument for SME’s to become your customer. At GCP Software we have built out-of-the-box solutions to support you in making digital banking easier, personal and profitable for your customers and for you. We provide Self-Service, Omni-channel and DIFM building blocks like Engage, Mobile technology and Hub. For more information click the link, check our product section or request a demo. In the live demonstration that will be given to you or your team, we will demonstrate the benefits.